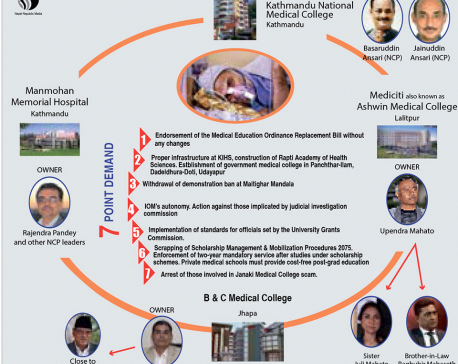 KATHMANDU, June 30: The government has registered the much-talked-about Medical Education Bill in parliament, laying the ground for hospitals owned by Nepal Communist Party (NCP) leaders and businessmen loyal to the party to run medical colleges of their own. The bill registered for replacing the existing Medical Education Ordinance brought in some six months ago has altered some of the existing provisions . Stakeholders have criticized the new provisions, claiming that these will pave the way for NCP leaders and hospital owners loyal to the party to run medical college without meeting the required criteria. The bill has made three major changes in the existing provisions, including in the provisions related to awarding letters of intent, providing affiliations and imposing a cap on universities granting affiliation to medical colleges. Besides scrapping the provision on not allowing the opening of additional medical colleges in the capital valley for the next 10 years, the bill has removed the provision limiting to five the number of medical colleges that a university can grant affiliation to. Removing the provision not allowing any hospital less than three years old to apply for starting a medical college, the replacement bill will mean newly opened hospitals can also be upgraded to medical college hospitals. The then government had brought in the existing ordinance following a row between communist party and NC lawmakers. Dr Govinda KC and various other activists who have lobbied hard for reform in medical education have long been against the proposed new provisions . Former education minister Dhaniram Paudel said parliament is free to hold deliberations on the bill tabled by the government and make necessary changes in it. “Parliament has the final authority in lawmaking . I hope it will find out what provisions should be mentioned in the bill and what should not,” he told Republica. NCP leaders own the Manmohan Hospital in Kathmandu while Durga Prasain, the owner of B&C Hospital in Jhapa, is close to the two chairmen of the NCP. Similarly, NCP leaders have been lobbying for granting affiliation to National Medical College in Kathmandu, which has time and again failed to meet the criteria set by the government . If the replacement bill registered in parliament is endorsed, all three of these hospitals will get their medical education license. The replacement bill has been registered just a week before the existing ordinance expires, leaving only a few days for parliament to deliberate the fraught issue. The government must endorse the replacement bill within a week to avoid invalidation of the existing provisions put in place through the ordinance. According to the constitution, an ordinance becomes invalid if its replacement bill is not endorsed by the House within 60 days of commencement of the House session. 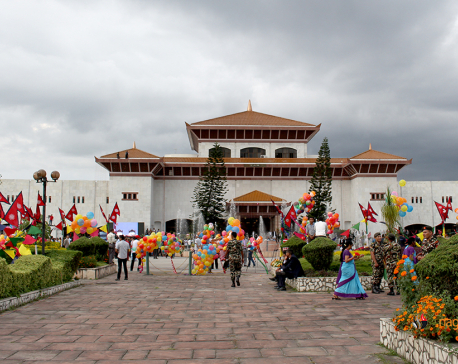 Back in April the president had re-issued the ordinance to avoid a legal void after missing the deadline for replacing it with a bill within two months of the commencement of parliament.